On the left is an original SIG SAUER MPX ban-state magazine, on the right a de-restricted magazine with full capacity. The SIG SAUER MPX, a very popular gun at the moment. There has, for somewhat baffling reasons to be honest, been a resurgence in the popularity of pistol caliber carbines. I personally had thought this trend had died in the 90s’ with the proliferation of rifle caliber platforms in comparable sizes. But for some reason, they’re back. Shooting the MPX, owned by a friend of the company, I can see why too: it can be shot at pistol-caliber-only ranges, it is reasonably accurate, it is cheap to shoot, it is essentially devoid of recoil, and it is fun. A friend of the company recently visited with his MPX. Moving from a ban state to a free state, he has a surplus of neutered 10 round magazines, otherwise identical to their full capacity brethren, but limited by a follower block which is an integral part of the magazine floor plate insert. At 50$ per magazine, almost highway robbery for a plastic magazine if you ask me, his ban-state collection is worth the value of a whole new firearm. Here we can see the follower block of a restricted SIG MPX magazine next to replacement MPX magazine floor-plate-inserts. These serve to control the spring and retain the baseplate without limiting capacity. 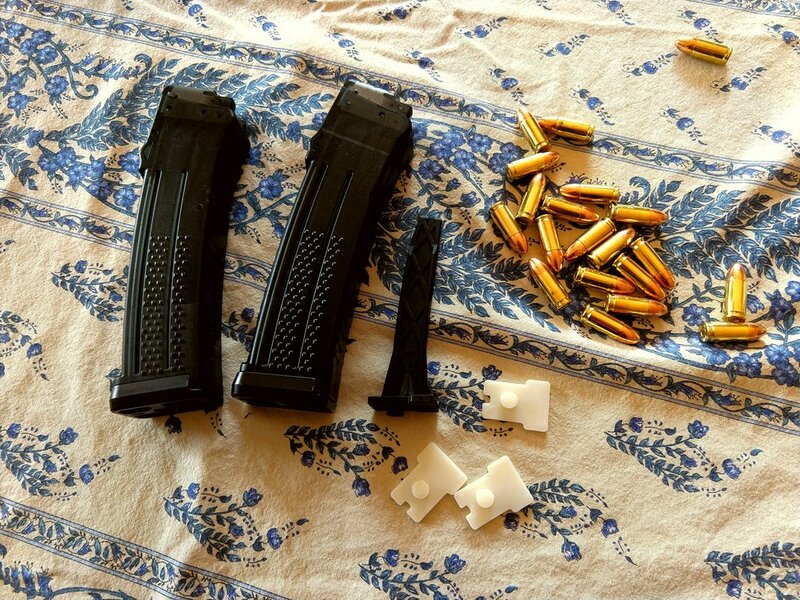 SIG glues their baseplates on ban-state magazines, but a few firm taps with a mallet or a little judicious application of a heat gun will readily break them loose and allow them to slide off. You can then remove the magazine floor plate insert w/ restrictor. But how to hold the magazine baseplate on then? You could simply cut off the restrictor, however if you wanted to go backwards you’d then be stuck. 3D printing to the rescue! 15 minutes of design and a little printing later, there you have it: a brand new magazine floor plate insert to allow full capacity in a SIG MPX magazine. A few firm taps with a mallet, maybe a little work with a heat gun, will remove the baseplate making the floor plate insert (restrictor) accessible. Pop it off, pop the new one in, and you’re good to go. For obvious legal reasons, if you are living in a ban state, we do NOT suggest you modify your magazines to give them an illegal capacity. In general it is our strongest recommendation, should you choose to enjoy firearms, you do so in a safe, responsible, and lawful manner.